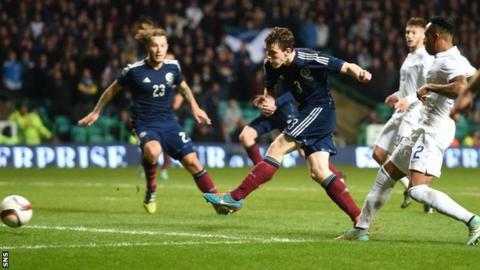 Robert Snodgrass says Hull City will have a hard task holding onto Scotland team-mate Andrew Robertson. The pair helped Hull gain promotion to the English Premier League with a 1-0 win over Sheffield Wednesday in the play-off final at Wembley. The attacking full-back has won rave reviews at the KC Stadium since his move from Dundee United two years ago. "I hope he stays with us but it'll be very hard to keep a hold of him," he told BBC Radio Scotland's Sportsound. Robertson missed a great chance to put Hull ahead when he blasted over with just the goalkeeper to beat, but Snodgrass praised his performance. "We had a laugh and a joke about it, but the young kid, he's in those positions and that's the most important thing for me," Snodgrass said of the 22-year-old. "I said to him 'don't lose that' because that is what's got you here in the first place, that drive and ambition to be in that sort of area." It was Snodgrass' lay-off to Mohamed Diame which led to the wonder strike that settled a nervy Wembley final and ensured Hull returned to the top flight at the first time of asking. It was a fine end to the season for the 28-year-old former Livingston, Leeds United and Norwich midfielder, who had to battle back from a dislocated kneecap which kept him out of the side for 15 months, only returning in November. "Everyone says that going up through the play-offs is the best way. After yesterday you realise they're not wrong," he said. "From start to finish it was probably one of the best days of my career. "You do think at the start of rehab 'Am I going to come back from this?' and little doubts start to creep in. But as a man of character you need to puff your chest out and do the long hours of rehab. Sometimes you're not leaving the swimming pool until 6pm. "When I came back I thought 'I've got a job to do here, I'm not just here to make up the numbers, I'm here to get in, help my team-mates and get promotion'. "I've played the last 25 games and I've not looked back." Snodgrass has also backed Steve Bruce to remain in charge, with the manager's position unclear after he said he will take time to consider his future. "You've got to look at his record for Hull City alone, never mind his playing record and the experience he brings. I just think as a man he fits the bill," he added. "I don't think you can look by Steve Bruce. He knows the division, he knows the players."